NEW YORK — Throngs of supporters gathered around Transport Workers Union Local 100 President Roger Toussaint as he led a huge April 24 march over the Brooklyn Bridge to the Manhattan jail where he began serving a 10-day sentence. Toussaint was slapped with the jail sentence — on top of $2.5 million in fines and loss of dues check-off for his 34,000-member union — for leading TWU members, who operate the city transit system, in a three-day pre-Christmas strike. The state’s Taylor Law bans strikes by public workers. The UN International Labor Organization has criticized the law as violating fundamental labor rights. 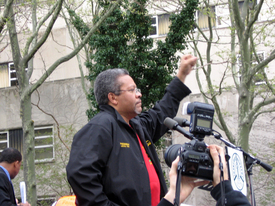 At a rally in downtown Brooklyn before the march, Toussaint was introduced as the “leader of the labor movement in this great city” by Patrick J. Lynch, head of the Patrolmen’s Benevolent Association, which represents city police officers. Even using a powerful sound system, Toussaint had to yell to be heard over thousands of cheering demonstrators. The demonstration at times took on the feel of a rock concert with the crowd roaring its support for Local 100. It was chaired by United Federation of Teachers President Randi Weingarten, whose union went for years without a contract. 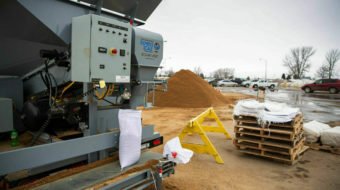 The rally, impressive despite being held at 4 p.m. on a workday, was organized by the state and city AFL-CIO, and had support from virtually every metropolitan area union. AFL-CIO President John Sweeney flew to New York to speak at the rally, but flight delays prevented him from getting to the event. “When Local 100 won the biggest transit strike in history, they held the line for all of us,” Sweeney later said. “Now it is time for all of us to hold the line for Local 100 and Roger Toussaint” by raising $2.5 million, Local 100’s fine, and “raising hell” to undermine the Taylor Law. Deborah Pierce, a member of the New York State Nurses Association who works at Woodhall Hospital, told the World the TWU’s actions benefited all workers. “This is not a democratic society if you’re telling people that you don’t have to negotiate in good faith, and they’re supposed to accept” a bad contract, she said. NYSNA has been without a contract for three years.